I can’t tell you how much I’m looking forward to flying to Orlando on Saturday – the thought of getting out of this dismal cold weather and soaking up that Florida sunshine is the only thing keeping me going this week. That’s I think that’s probably one of the things that’s so brilliant about travel – it’s the chance to leave everything behind and to be totally carefree for a few days, a week, or more; which is why I’m a firm believer in always having a holiday booked, even if it’s months away, so you always have something to look forward to, and keeping an eye out for a great holiday deal. So as a travel journalist, travel blogger and of course, mum I was very interested to hear about the new ABTA Earlybird campaign from ABTA (the Association of British Travel Agents) which is encouraging us to book our holidays this month and next to take advantage of the best possible holiday deals. 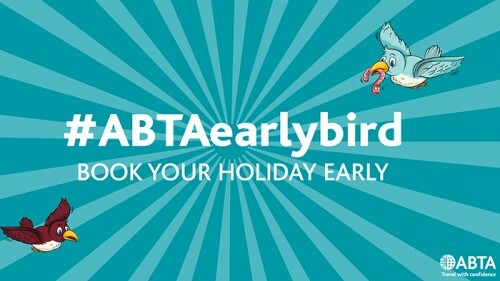 The early bird catches the worm – and the ABTA Earlybird can take advantage of offers including free child places, low deposits, cheaper prices, more availability and better choice (the earlier you book, the greater your chances of getting all these). It’s really a no-brainer, IMHO. Booking early also means that you can budget for your holiday – paying off a little each month. While getting a late deal can work out well, particularly if you’re flexible about your plans, I think that when you’re travelling with children you really do need to be able to plan as much as possible in advance – plus the greater your chances of getting that sweet holiday deal.